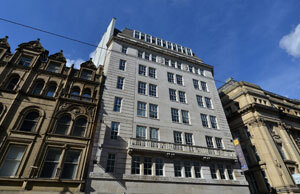 Today OBI announced media agency, Republic of Media has expanded its office space in 26 Cross Street, Manchester M2 7AQ. The letting follows the recent acquisition of 26 Cross Street where OBI advised Ventnor Group on the £11.5 million deal representing a yield of 5.5%. Republic of Media has taken the whole fifth floor (2,830 sq ft) on a five year lease. The agency has also has an office in Edinburgh. OBI is the sole leasing agent on 26 Cross Street after representing Ventnor on the building acquisition. 26 Cross Street is the second building purchased by Ventnor in Manchester having bought Kabel House on Quay Street for £7 million last October. Will Lewis, Transactions and Asset Management, OBI Property said: “We’ve worked successfully with Ventnor in the past on buildings where asset management strategies can be carefully implemented and 26 Cross Street is another great opportunity for us to add real value.